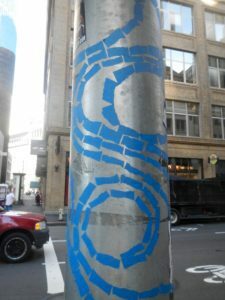 Masking Tape graffiti is quickly becoming a popular way for street artists to create masterpieces in public spaces. The novelty, practicality and non permanence of masking tape make it a perfect medium for street artists. And the linearity of masking tape leads to some really cool designs! You will see masking tape graffiti used in all kinds of places including walls, poles and directly on the streets and sidewalks. Why is masking tape becoming so popular with street artists? First of all, it isn’t permanent. Most artists are not interested in being arrested. They just want to share their incredible talents with the rest of us. 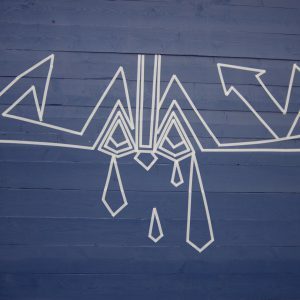 Since the masking tape is fairly durable and yet easily removed, it is the perfect solution for creating graffiti. Additionally, crepe paper masking tape is biodegradable. It quickly breaks down after it is removed from an art installation. I can definitely better appreciate a non-permanent art installation if I know that it won’t live forever in a landfill! Do “Real” Artists Use Masking Tape? Yes, as a matter of fact, there are quite a few artists who use masking tape to create their masterpieces. 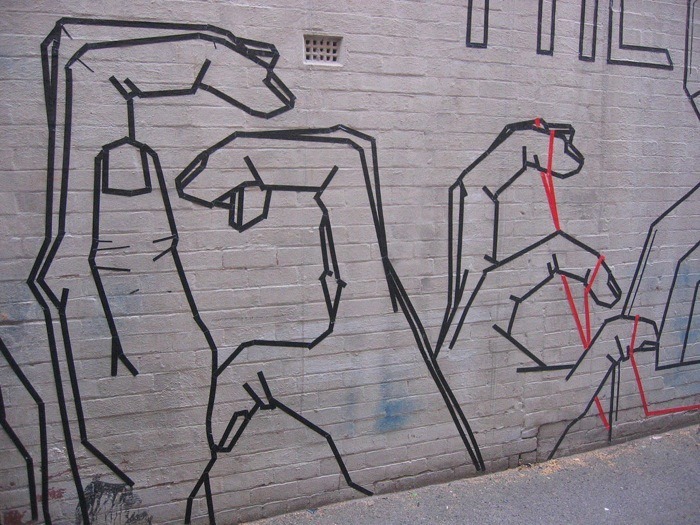 One in particular, Buff Diss, is an Australian artist who creates amazing graffiti using only masking tape. He started out using spray paint to create his street art, but then he switched to masking tape in 2005. Using masking tape as a medium presented him with an avenue to “civilly disobey” in a way that he feels okay about. Check out his Flickr stream, to see some of his fabulous work using only masking tape. Buff Diss sat down for an interview with Upper Playground to talk about his street art. I love listening to this guy talk, both because of what he has to say as well as his incredibly calming way of talking. Watch the video below and see what you think. Are you inspired to get outside and be creative? I know that I am! Get outside and create a graffiti masterpiece on your driveway or brick wall if you have one! Don’t forget to share your creations in the comments section. Happy taping!